Later in the summer is a great time to think about a different twist on some vegetables you may getting tired of. I for one never tire of okra but do love pickling those small, short, tender ones that seem to grow this time of year or like me this morning you start to see them at the market. These in particular came from the South of the James Market. Peel garlic and smash with the back off a knife, slice jalapenos into strips discarding seeds. Remember that white vein is the heat so remove for a less spicy pepper. 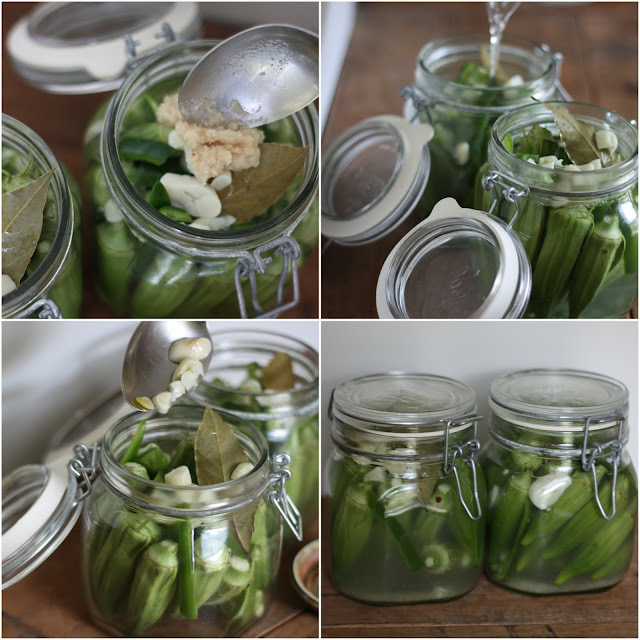 Slide okra, bay leaf, and peppers into jar. Combine vinegar, sugar, salt, garlic, and water into a pot. Bring to a simmer remove from heat and let cool for 10 minutes or so. Pour liquid over the okra in the jars and add horseradish. Tighten lid and carefully shake to mix. Allow to reach room temperature before placing in the fridge.72 hours everything is good to eat. Waiting longer only improves the taste. These will be enjoyed next weekend.